What Makes The Perfect Window? This was the question we asked ourselves when we began to explore manufacturing an exclusive vinyl replacement window. We knew that we would only put our name on a product that we would install in our own homes. Because of this principle, we built from scratch a vinyl replacement window that we would proudly provide for our own families. THE RESULT IS THE GREENX500. Our exclusive vinyl replacement window features cutting-edge innovation and state-of-the-art design. As a result, our window will immediately increase your home's appearance and interior comfort. Every decision we've made in building the GREENX500 was with our customer's satisfaction in mind. We are proud of the GREENX500 and firmly stand by our product. 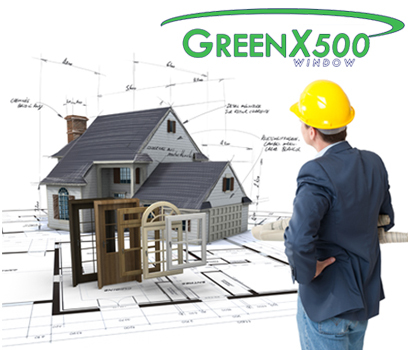 Call or E-Mail us today to find out first hand the difference the GREENX500 Window will make for your home.